Who doesn't love cracking open a fortune cookie and seeing what's in store for their future or reading something nice about their personality? Well, I do, especially when it's something good, plus you get to eat a cookie. A month or so ago, I read an article in Cottage Living (I think) about a woman's cute cottage decor and she had a big post in her home with tons of fortunes tacked up all over it. That sparked the idea for my fortune cookie card. I thought it would be fun to give a card that the receiver interacted with a bit. I did a mock up and had it resting on my desk for several weeks. Each person in my family mentioned in passing that they really liked it, so I thought I would put it in my etsy shop and give it a go. Here are some photos of it. 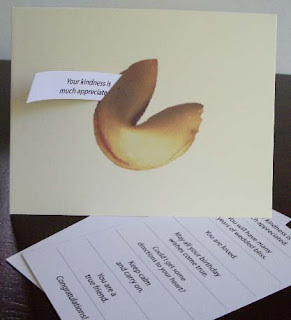 It comes in a package of 5 cards with 1 list of fortunes to cut and insert in the cookie and 1 blank card to create your own fortunes. 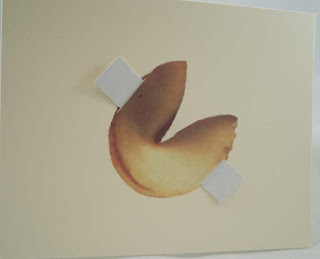 Feel free to leave a comment if you have any good fortunes. You are just getting WAY too clever...I love this! What a great idea! This idea/design is amazing. Wow. These are going to sell really well, I'm sure!